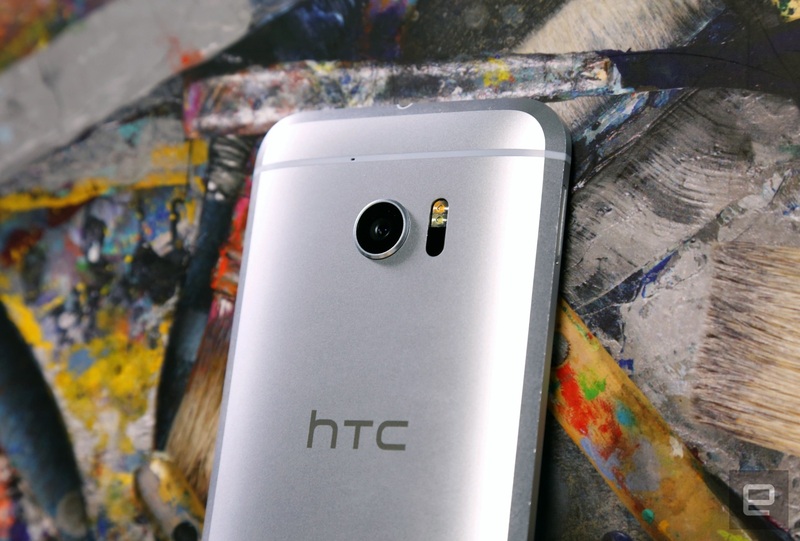 HTC got its groove back. HTC has done it. The company's new flagship smartphone, the 10 (yes, that's the name, and no, I don't like it either), is a credible contender for Android greatness. I've spent a little over a week using it as my daily driver, and while the name still irks the hell out of me, the device itself doesn't. Mostly, anyway. For a company that has seen some rough seas lately, I'm glad HTC has remembered how to make a great smartphone. The thing is, its competitors haven't been lazing around; they've been upping their game too, and now the contest for the crown is tougher than ever. 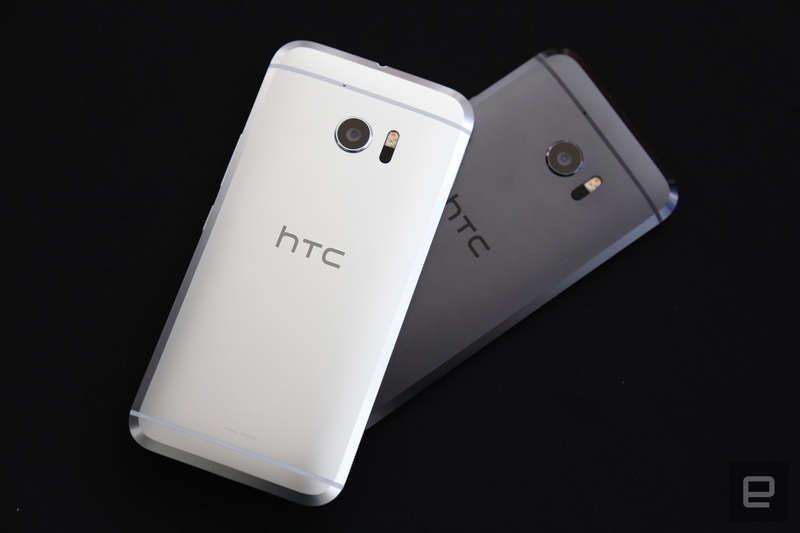 When it comes to winning hearts, minds and market share, HTC is at a disadvantage. None of us can say what the future holds, but either way, the 10 is a step in the right direction. Simply put, this is the best phone HTC has made in years. It's fantastic, though not exactly perfect. While its build quality is tremendous and there's plenty of horsepower under the hood, HTC still isn't quite as good as Samsung at cameras, while the battery life here is hit-or-miss. Still, the 10's lightweight Android skin and great audio performance (in addition to everything else) could make it a better choice for some than either of Samsung's Galaxy S7 phones. How would you rate the 10? 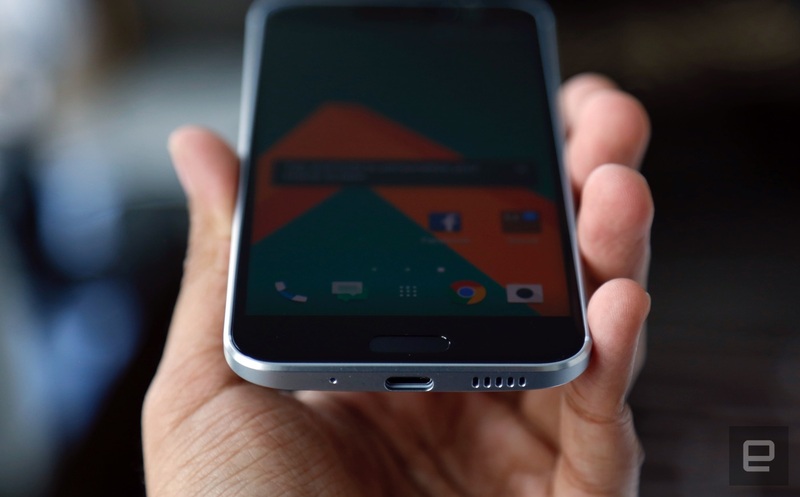 Hewn entirely from aluminum and glass, the HTC 10 is about as well built a smartphone as you'll find. Phone nerds of a certain vintage will remember the thrill that came from picking up the HTC One M7. Indeed, I felt an echo of that same excitement when I first started playing with the 10. That's more than I can say about either of the hero phones HTC has released within the past year. Still, the 10's design won't be for everyone, especially with strong competition from the likes of Samsung's Galaxy S7 Edge. It's a bit nondescript when viewed from the front: There's the 5.2-inch Super LCD 5 screen, swathed in a sheet of Gorilla Glass 3, with a fast fingerprint sensor/home button underneath. Flanking the home button are two capacitive navigation buttons; HTC would rather use every millimeter of the screen for content, but I know a few people who'd be less than pleased. Me? I'm not particularly bothered by it: The buttons are responsive, and unlike Samsung, HTC puts the Back and Menu keys in the right place. Meanwhile, you've got a 5-megapixel camera above the screen, with optical image stabilization (! ), along with the earpiece. That earpiece actually doubles as part of HTC's updated BoomSound system; it works in tandem with the speaker on the bottom edge to produce good (but not amazing) sound. We'll get into that in a bit. The rest of the tour is pretty prosaic: There's a USB Type-C port on the bottom for fast charging, SIM and microSD slots on opposite sides and a 12-UltraPixel camera on the 10's back cover. 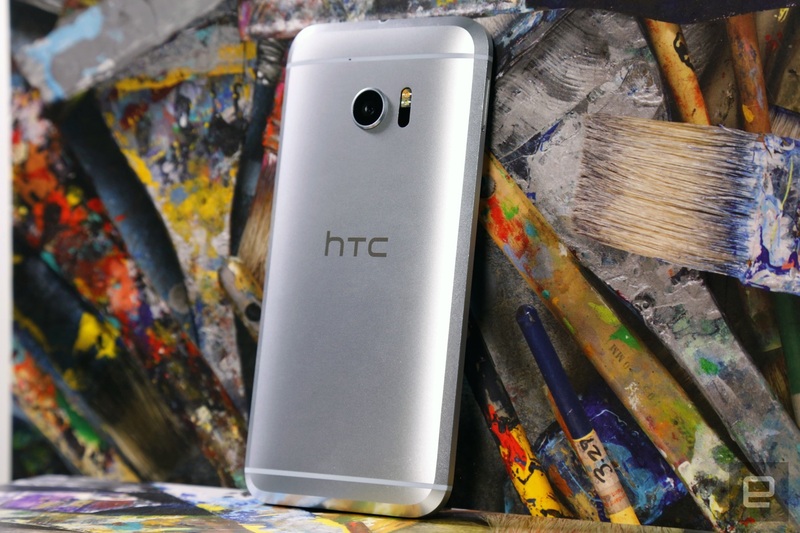 Those broad strokes might not sound fascinating, but HTC's attention to detail is what makes the 10 feel exciting. A chamfered edge runs around the screen's Gorilla Glass cover, leaving virtually no gap between the glass and the metal. This time, the power button and volume rocker don't wiggle in their sockets. Another chamfered edge on the 10's back has a different finish that reflects light differently, and has the functional benefit of giving your fingers a comfortable place to rest. And unlike the curved backs we saw on the GS7 and GS7 Edge, the 10's more pronounced slope means it settles even more comfortably into the hand. I love the 10's look, and you might not. Either way, there's no denying this is one thoughtfully designed device. Too bad it's not waterproof; just water resistant. As usual, some of the 10's most important facets can't be gleaned with the naked eye. There's a quad-core Snapdragon 820 chip inside that reaches clock speeds as high as 2.2GHz. That's paired with an Adreno 530 GPU and 4GB of RAM to keep things running smoothly. I know what you're thinking, though: That configuration is about as exotic as cheddar cheese these days. You're right, but even so, those internals generate enough horsepower that you won't see me complaining. The unit I'm testing is the $699 "open-channel" model that supports T-Mobile and AT&T out of the box (even though the latter doesn't seem interested in selling the 10) and has 32GB of internal storage. Thankfully, the 10 can take up to 2TB of additional storage (good luck finding a microSD card that big). As it turns out, some markets will have more fun than others: a 64GB model will be available ... somewhere. Meanwhile, people who buy the HTC 10 in the US won't get the hi-res-certified earbuds offered in Europe and Asia. Samsung is arguably the king of smartphone screens, but HTC managed to put up a decent fight with the 10. As mentioned earlier, we've got a 5.2-inch Super LCD 5 display running at Quad HD resolution. That makes it the first 2K HTC phone to land in the United States. As you'd expect, text is sharp and details abound, but I'm also really enjoying the screen's saturation levels. See, the panels used in Samsung's GS7 line are warm even on the default Adaptive Display setting, while the G5's "Quantum" display can appear lifeless at times. The HTC 10, on the other hand, manages to chart a course right between the two: Whites take on an even, cool tone, and colors feel lively without getting in your face. And if these colors aren't to your liking, fear not: A quick jump into the display settings lets you swap them for the standard sRGB color gamut, a more conservative option. Viewing angles are great, too, but there's a rub: The screen takes on a slightly reddish hue when you look at it from too far off-center. It's a mild annoyance made more pronounced by how good the screen usually is. In addition, the screen has one more thing going for it. HTC went with a low-latency panel to reduce the amount of time between when your finger touches the panel and when the panel senses it. It's hard to quantify what kind of difference we're actually getting, but the 10 feels seriously fast nonetheless. HTC is also jumping on the hi-res audio bandwagon with its updated BoomSound Hi-Fi system. It manifests differently depending on what sound setup you're working with, and, obvious though it may seem, you're much better off with headphones. There are a woofer and tweeter built into the 10, so the phone's speakers produce sound with a nice, clean atmosphere. You've also got the option to switch between movie and music modes, though switching doesn't always make much difference. Sadly, all you'll get from those speakers is mono sound; the sweet, sweet channel separation that came with those old-school stereo BoomSound speakers might be gone for good. Don't get me wrong: HTC's speaker setup is the best you'll find right now; it just lacks the oomph that HTC used to be known for. Plugging in headphones makes for a different story, though. 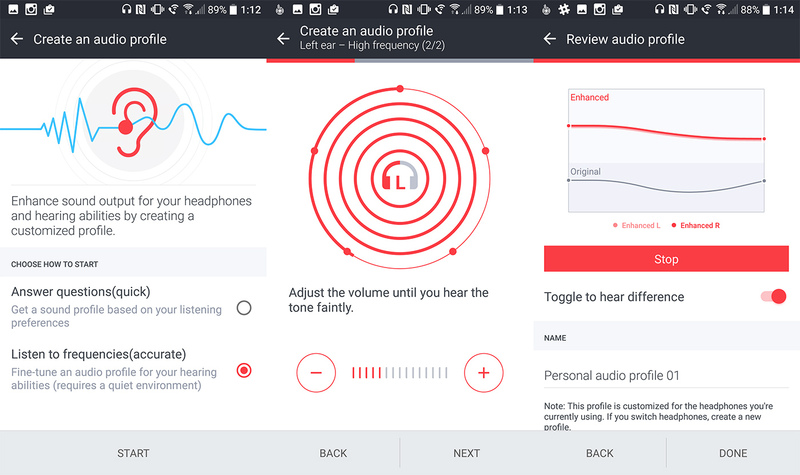 You'll be asked to set up a personal audio profile the first time you do -- you'll listen for tones with each ear, which will ultimately leave you with a specific setup for your ears and headphones. And yes, you can have multiple profiles for different headphones. The result (in my case, anyway) was louder, slightly brighter audio all around. HTC says the 10 also upscales all audio to 24-bit quality, but some people will get more out of that trick than others. 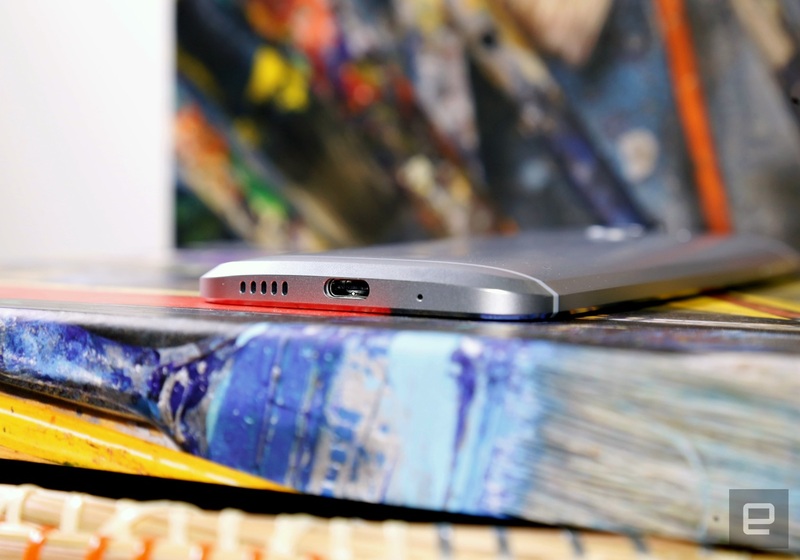 The 10 is also the first Android phone that supports Apple's AirPlay streaming standard out of the box. Swiping up on the screen with three fingers launches HTC's Connect app, where you'll find all your DLNA-, Miracast- and now AirPlay-compatible speaker systems in range. Pairing the 10 with my Apple TV was surprisingly painless. A couple quick taps and I was listening to the soundtrack from The Last Five Years on my television. The connection was stable even as I moseyed around the house. The only real downside is that there's currently no way to stream video to the Apple TV. A few years ago, HTC started reducing the impact its Sense UI had on Android's performance, as well as the general experience. I'd argue that any progress is good progress on that front, but with the 10, it feels as if HTC hardly painted over Android at all. What we've got is the lightest, cleanest version of Sense yet, and it's mostly a pleasure to use. The core of the 10's software setup is a build of Android 6.0.1 Marshmallow (which we've explored in detail here), but some of HTC's touches are hard to miss. Swiping right on the home screen brings you into BlinkFeed, which still populates your screen with news stories and social updates for when you're killing time in line. Beyond just new tweets and Google+ posts, BlinkFeed is also supposed to offer up recommendations for places around you to eat, drink and be merry, though they never appeared for me. As far those home screens go, the only other HTC touch that's enabled by default is the clock widget; even the location-based app suggestions widget has to be manually turned on. (Thankfully, too, those suggestions are much better this time around.) 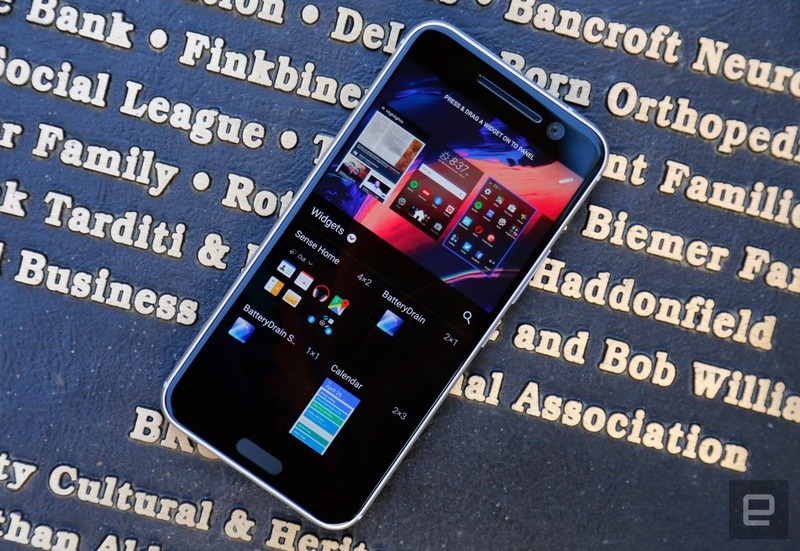 HTC's dark-colored app launcher is still around as well, with options to hide and sort your apps just like always. Minor gripe: You can fit only 20 apps onto a single page (a 4x5 grid), which leaves a lot of empty space around icons. If HTC's design choices don't suit you, you can still download or create themes for the 10. 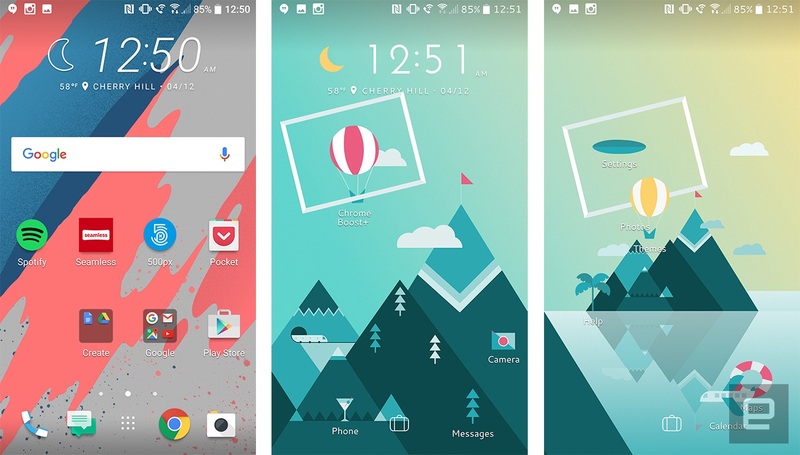 New this time around are what HTC calls "Freestyle" themes. Instead of having your apps aligned on a grid, you can add stickers of different sizes to your home screen, and even have them overlap. There's only one such Freestyle theme here (the vaguely nautical "Journey"), and while it's definitely not for me, a few children I've shown it to were just tickled. While we're on the subject of apps, HTC has done a fine job cutting back on its preloaded apps. Think: its browser, Scribble and Polaris Office. There's always been some overlap between HTC's apps and Google's, and the former finally decided to trim the fat, because certain stock Android apps just work better. There's at least one example of Google changing its products to mesh with HTC's dialed-back approach: HTC's Gallery app supported RAW photo files, and now that that's gone, Google's Photos app supports those uncompressed images instead. However, this shift doesn't mean the 10 doesn't ship with any third-party apps; Instagram and Facebook are here, and carriers will probably go to town with bloatware eventually. HTC also included a resource management app called Boost+ that lets users clear up memory, increase battery life during games and prevent certain apps from launching without first inputting a swipeable security pattern. It's a neat touch, though many people will ignore it all the same. Still, that hasn't stopped HTC from releasing it for other Android phones as well. Let's be honest: HTC hasn't always had a great track record with its cameras. I was prepared to be let down this time, but that didn't turn out to be the case. While not perfect, the 10's 12-UltraPixel cameras and f/1.8 lens make for a very competent main shooter. If you're not familiar, "UltraPixels" are what HTC calls the larger pixels on its camera sensors (the ones here are 1.55μm big). 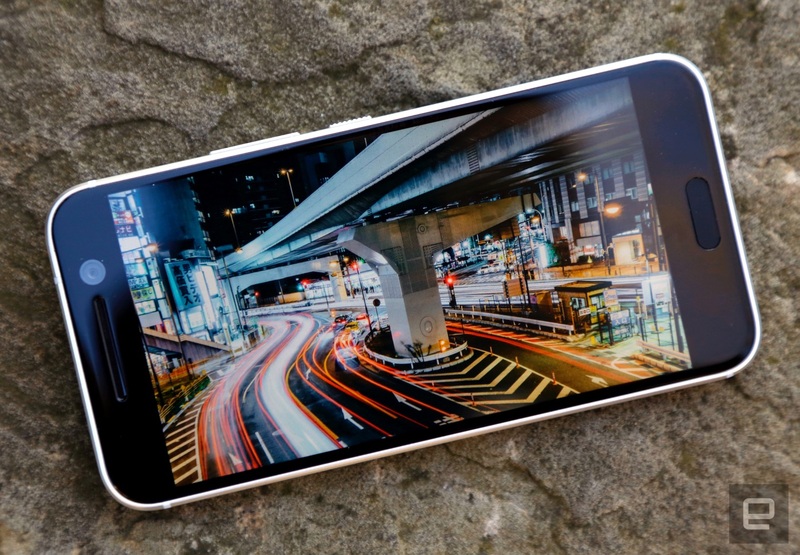 Since the days of the original UltraPixel camera, though, smartphone makers like Samsung and Apple have also jumped on the big-pixel bandwagon, mostly for better low-light performance. That slightly technical prelude aside, the 10's main camera captures near-uniformly lovely shots with nicely saturated colors and fine details. I wish HTC had pushed the envelope on resolution, though, and managing your exposure can be a little tricky. See, when you tap to focus on a subject, a small exposure slider pops up for your fiddling pleasure. Dragging a slider isn't as intuitive as tapping to lock focus and exposure, so it's not uncommon to get photos that are a hair too bright compared with the GS7. Thankfully, this is an issue that a future update could fix. Since I've already started to talk about focusing, I'll note that the 10 uses a laser autofocus module that's sometimes as fast as the GS7's Dual Pixel sensor setup. In favorable conditions (say, outside on a lovely spring day), it's usually a pleasure. Keyword: "usually." Sometimes I'll get an error saying something is obstructing the autofocus module. More often than not it's my finger, but at least once or twice, I couldn't figure out why it was complaining. And when it gets dark, the autofocus starts to struggle a lot more. It'll take a few tries to lock onto what's in front of it, and the resulting photos can be indistinct and smudgy. Samsung definitely has the edge in the dark. If extra control is what you're after, the 10's Pro Mode is probably where you'll spend most of your time. Sliders give you manual control over white balance, ISO, shutter speed and focus, plus the option to save photos as uncompressed RAWs. Fair warning, though: Saving as RAWs can take two to three seconds longer than with normal JPEGs. It's also too bad the Pro Mode doesn't work when you switch to the 5-megapixel front camera: Who doesn't want meticulously adjusted selfies? Jokes aside, the front camera is surprisingly solid, producing crisp results aided by its optical image stabilization. Just like most recent smartphones I've tested, the 10 also shoots 4K video, though only for six minutes at a time. Resulting clips are bright and nicely detailed, and you can record hi-res audio to go with it if that's your thing. I still have trouble telling the difference, but at least that high-quality audio doesn't add too much to your 4K video's file size. So far, I've tested two flagship smartphones with a Snapdragon 820 chip, 4GB of RAM and an Adreno 530 GPU, and both have been terrifically fast. 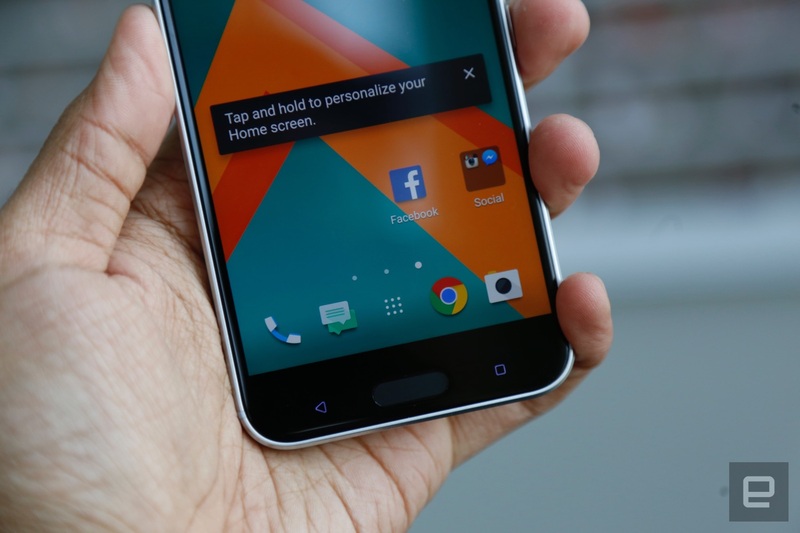 The HTC 10 is number three. Nothing I threw at it over the past week of testing was able to give it pause, from benchmarks to graphically intensive games like Dead Trigger 2 to frantically leaping between apps to see if I could break something. Since all 820-powered phones have a strong foundation to work from, it's the little touches that ultimately make some devices more enjoyable to use than others. I only wish the 10 had more consistent battery life. HTC says the 10 can go for up to two days without needing a charge, and that's technically true; it just depends on what you're doing with the thing. My workdays are filled with lots of emails, Slack messages, phone calls and YouTube videos, and the 10 would typically stick around for about 13 hours of relatively consistent use before needing a recharge. Over a quiet weekend, though -- when I mostly used the phone for coordinating plans and listening to podcasts -- the 10 stuck around from Friday night to Sunday night without a problem. Meanwhile, in our official rundown test (looping a video with the screen brightness set to 50 percent and Wi-Fi connected), the 10 lasted just over ten and a half hours. That means it ranks above the G5 (10.5 hours on the nose) but falls short of the Galaxy S7 siblings, each of which managed 13-plus hours. Curiously, when checking the battery drain over time, there were a few moments when power consumption jumped dramatically, and I can't really figure out why. While you'll get some respectable longevity out of the 10's battery on occasion, it's mostly a mediocre performer in this regard. At least there's a QuickCharge 3.0 charger included in the box that takes the 10 from zero to half full in half an hour. I've been drawing comparisons between the HTC 10 and Samsung's Galaxy S7 ($649+) and S7 Edge ($749+) this whole time, so let's just address this beef head-on. These devices arguably represent their respective makers at the peak of their design and production prowess, making the choice between them largely a matter of taste. While Samsung's camera performance and battery life are superior to the 10's, I'd argue the 10 is the better-built device, and its much lighter approach to software makes it more pleasant to use. 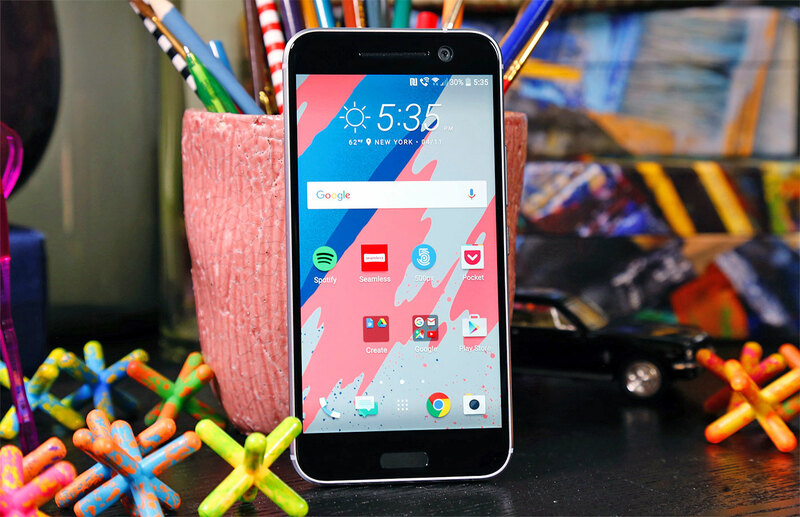 If you're an audio aficionado, you'll also be better off with the HTC 10. LG's G5 ($629+) is a contender, too, though in many ways it lacks the polish of either the HTC 10 or a Galaxy S7. What it lacks in finesse it tries to make up for with sheer novelty: You can plug in different hardware modules to make the phone more versatile. This strategy might make the phone more useful over time, but it's of questionable value right now. The G5 could be a great phone in the future, but the 10 is the better machine now. Oh, and if you're more concerned about software, there's always the Nexus 6P. Huawei has proven itself as a first-rate phone maker, and the lure of unfettered Android Marshmallow (complete with fast and frequent updates) is worth contemplating. Then again, it has last year's high-end Qualcomm chipset, so those searching for sheer power would do better with a 10. 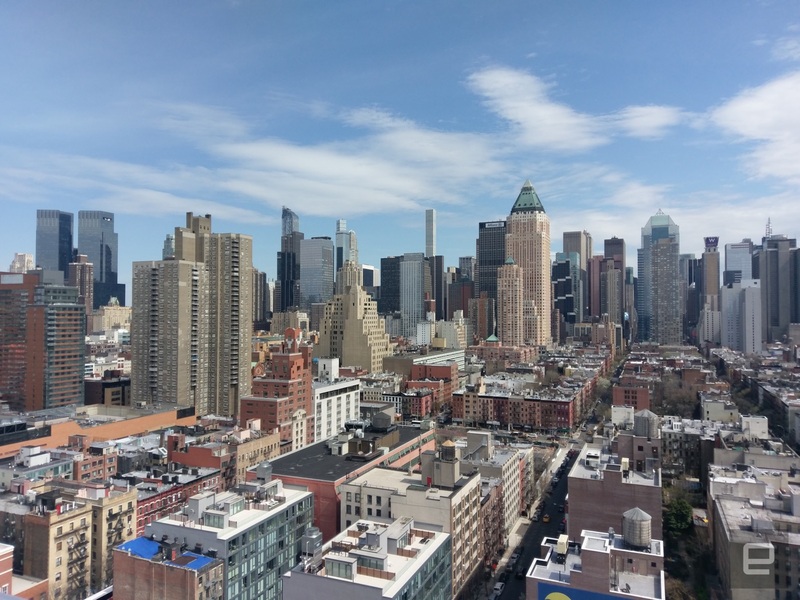 A few days ago, I wrote about fighting the urge to be too optimistic about the 10. HTC has let me down before, after all. Despite everything, I still walked into this review with a certain set of expectations I quietly hoped the 10 would meet. And you know what? This phone met them, almost across the board. The HTC 10 is an incredibly well-built device, with top-tier horsepower and -- crucially -- software that doesn't drive me up a wall. The company has also upped its camera game considerably, though the results still fall short of some competitors. Sure, I wish the battery life were a little better, but it's not a deal-breaker. These shortcomings are enough to keep me from calling it the best all-around Android phone out there, but man, it's close. 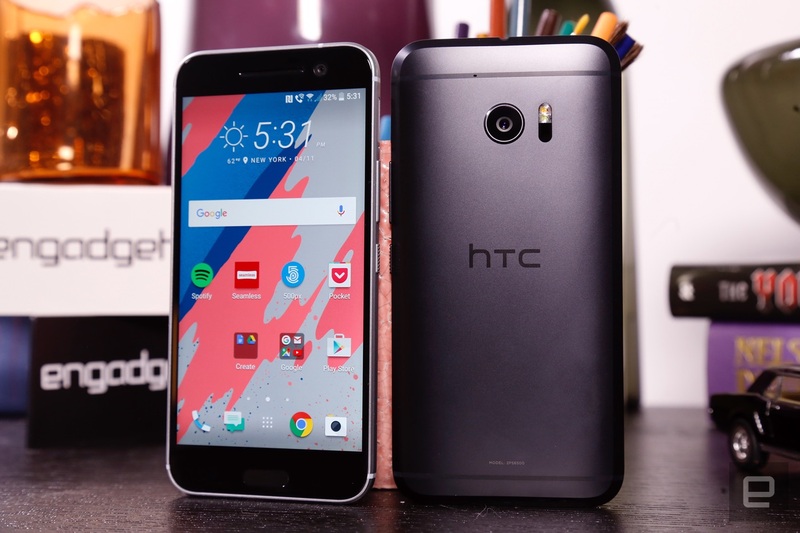 Of course, your tastes might make for a different ranking, so I'll leave you with this: If you're searching for a fantastic new smartphone, HTC 10 is definitely worth a look.